Custom Vega Darts L3c Signature Flights produced by L-style. 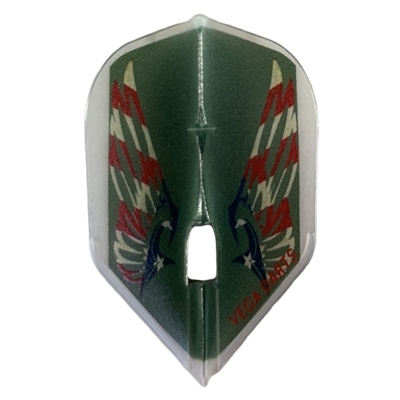 They are clear white flights with American flag eagle wings on a green background. Limited production print. Compatible to the Champagne Ring. Together, the flight and shaft makes an ultimate hold, prevents robin-hoods, and create long durability. Shape is very similar to Standard but a little bit smaller. If you want a flight with good lift that's not too big this is a great balance. Just enough drag to keep the dart straight but not so much that it slows down the dart. Works best with nylon or carbon shafts. Dimensions: Width from wing to wing 34mm. Overall length 44mm. *Does not come with champagne ring. © Copyright 2016 Vega Dart Inc. All Rights Reserved. Built with Volusion.